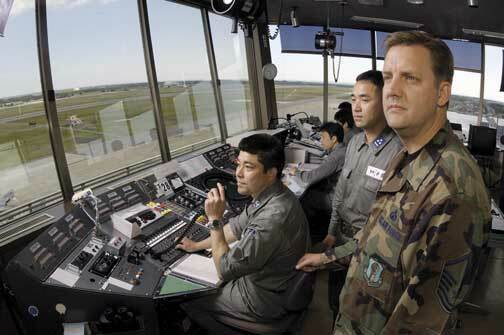 Controllers survey the field at Misawa Air Base, Japan. Air traffic controllers are people who operate the air traffic control system to expedite and maintain a safe and orderly flow of air traffic and help prevent mid-air collisions. They apply separation rules to keep each aircraft apart from others in their area of responsibility and move all aircraft safely and efficiently through their assigned sector of airspace. 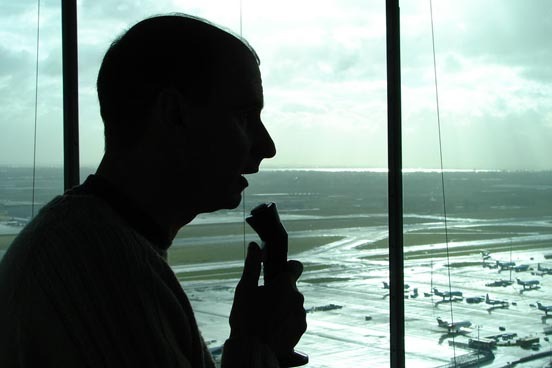 Because controllers have a demonstrably large responsibility while on duty, the ATC profession is often regarded as one of the most difficult jobs today, and can be notoriously stressful. Although the media frequently refers to them as air controllers, or flight controllers, most air traffic professionals use the term air traffic controller. They are also called air traffic control officers (ATCOs), air traffic control specialists, or simply controllers. Air traffic controllers are generally individuals with excellent memory, are organized, have spatial awareness, are quick with numeric computational skills, are assertive but calm under pressure, and are able to follow and apply rules yet be flexible when necessary. Almost universally, trainee controllers begin work in their twenties, and retire in their fifties. Rigid physical and psychological tests and excellent hearing and speaking skills are a requirement, and controllers must take precautions to remain healthy and avoid certain medications that are banned for controllers. Most training focuses on honing the ability to absorb data quickly from a variety of sources, and to use this to visualize, in time and space, the position of each aircraft under control, and to project this forward into the near future. This skill is termed situational awareness (having the picture or having the flick), and is central to the job. Maintaining a constantly-moving visual scan among all aircraft under one's control, without "fixating" on a particular situation, is how controllers help maintain this overall flick. This is then used to make relatively simple rule-based decisions very quickly and accurately to keep aircraft separated in the sky while moving traffic as expeditiously as possible and presenting the traffic in an orderly and useful manner to the next sector. Communication is a vital part of the job: controllers are trained to precisely focus on the exact words pilots and other controllers speak, because a single misunderstanding about an altitude level or runway number for example can result in tragedy. Controllers communicate with the pilots of aircraft using a push-to-talk radiotelephony system, which has many attendant issues such as the fact only one transmission can be made on a frequency at a time, or transmissions will merge together and be unreadable. Although local languages are sometimes used in ATC communications, the default language of aviation worldwide is English. Controllers who do not speak this as a first language are generally expected to show a certain minimum level of competency with the language. Teamwork plays a major role in a controller’s job, not only with other controllers and air traffic staff, but with pilots, engineers and managers. Some controllers feel that this is the only part of their job that is accurately portrayed in the movie Pushing Tin. Area controllers are responsible for the safety of aircraft at higher altitudes, in the en route phase of their flight. In most nations they are known as "area" or "en route" controllers. Airspace under the control of Area controllers is split into sectors which are 3D blocks of airspace of defined dimensions. Each sector will be managed by at least one Area controller. This can be done either with or without the use of radar: radar allows a sector to handle much more traffic, however procedural control is used in many areas where traffic levels do not justify radar or the installation of radar is not feasible. Area controllers work in Area Control Centers, controlling high-level en-route aircraft, or Terminal Control Centers, controlling aircraft at medium levels climbing and descending from major groups of airports. 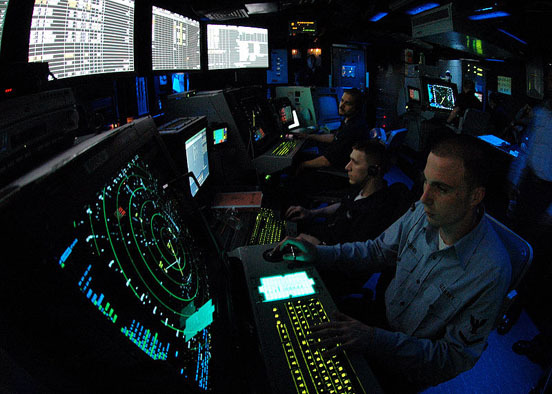 A military air traffic controller works approach controller in Carrier Air Traffic Control Center (CATTC) aboard the Nimitz class aircraft carrier USS Abraham Lincoln (CVN 72). Most countries' armed forces employ air traffic controllers, often in most if not all branches of the forces. Although actual terms vary from country to country, controllers are usually enlisted. In some countries, all air traffic control is done by the military. In other countries, military controllers are only responsible for military airspace and airbases; control of airspace for civilian traffic and civilian airports is done by civilian controllers. Historically in most countries this was part of the government and controllers were civil servants. However, many countries have partly or wholly privatized their air traffic control systems; others are looking to do the same. Civilian Air Traffic Controllers' licensing is standardized by international agreement through ICAO. Many countries have Air Traffic Control schools, academies or colleges, often operated by the incumbent provider of air traffic services in that country, but sometimes privately. These train student controllers from walking in off the street to the standards required to hold an Air Traffic Control license, which will contain one or more Ratings. These are sub-qualifications denoting the air traffic control discipline or disciplines in which the person has been trained. ICAO defines five such ratings: Area (procedural), Area Radar, Approach (procedural), Approach Radar and Aerodrome. In the United States, controllers may train in several similar specialties: Tower, Ground-Controlled Approach (GCA), Terminal Radar Control, or Enroute Control (both radar and non-radar). This phase of training takes between 6 months and several years. Whenever an air traffic controller is posted to a new unit or starts work on a new sector within a particular unit, he or she must undergo a period of training regarding the procedures peculiar to that particular unit and/or sector. The majority of this training is done in a live position controlling real aircraft and is termed On the Job Training (OJT), with a fully-qualified and trained mentor or On the Job Training Instructor (OJTI) also 'plugged in' to the sector to give guidance and ready to take over in a second should it become necessary. The length of this phase of training varies from a matter of months to many years, depending on the complexity of the sector. Only once a person has passed all these training stages, will they be allowed to control on their own. Typically, controllers work "on position" for 90 to 120 minutes then they get 30 minutes break. Except at quieter airports, Air Traffic Control is a 24 hours, 365-days-a-year job. Therefore controllers usually work rotating shifts, including nights, weekends and public holidays. These are usually set twenty eight days in advance. In many countries the structure of controllers' shift patterns is regulated to allow for adequate time off. There is a mandatory retirement age of 56 for controllers who manage air traffic. The retirement age can be moved up to 61, considering the controller has exceptional experience. Many countries regulate the hours that a controller can work on safety grounds. Research has shown that where controllers remain ‘in position’ for more than two hours even at low traffic levels, performance can deteriorate rapidly. Many national regulations therefore feature a two-hour limit on time spent controlling without a break, in addition to controls on length of shifts, number of night shifts done consecutively, length of time off required between shifts, etc. A typical work week for a controller is an 8 hour day, 5 days per week if the facility is correctly staffed. A hiring emergency in the United States has led to some locations having Air Traffic Controllers work 10 hours a day, 6 days a week (mandatory). Despite years of effort and the billions of dollars that have been spent on computer software designed to assist air traffic control, success has been largely limited to improving the tools at the disposal of the controllers such as computer-enhanced radar. It is likely that in the next few decades, future technology will make the controller more of system manager overseeing decisions made by automated systems and manually intervening to resolve situations not handled well by the computers, rather than being automated out of existence altogether. However there are problems envisaged with technology that normally takes the controller out of the decision loop but requires the controller to step back in to control exceptional situations: air traffic control is a skill that has to be kept current by regular practice. This in itself may prove to be the largest stumbling block to the introduction of highly automated air traffic control systems. NAV CANADA, the country's civil air navigation services provider, is a private sector, non-share capital corporation financed through publicly-traded debt. NAV CANADA provides air traffic control, flight information, weather briefings, aeronautical information services, airport advisory services and electronic aids to navigation. In the U.S., a majority of the air traffic control workforce will retire over the next 10 years. As a result, the Federal Aviation Administration is hiring more than 12,000 new trainees (that take 3–5 years to become fully certified controllers) over the next decade. There are many avenues to become an Air Traffic Controller. There are 23 CTI (Collegiate Training Initiative) schools around the United States which also provide a college degree in the process. After graduation, personnel are then placed on a list that depicts hiring eligibility. The Federal Aviation Administration then selects personnel from this list and places new hires in a location. The Federal Aviation Administration also hires Air Traffic Controllers who have separated from the United States military. The cut-off age for hire is 31. Finally, the Federal Aviation Administration also hires from the public. Prior experience or training in air traffic control is not required. However, candidates must have three years of progressively responsible work experience, have completed a full 4-year course of study leading to a bachelor’s degree, or possess an equivalent combination of work experience and college credits. In combining education and experience, 1 year of undergraduate study (30 semester or 45 quarter hours) is equivalent to 9 months of general experience. Certain kinds of aviation experience may be substituted for these requirements. U.S. citizenship is required. Candidates must be able to speak English clearly enough to be understood over radios, intercoms, and similar communications equipment. Controllers employed by the Federal Aviation Administration are paid according to the level facility in which they work for, and if they are in training or Certified Professional Controller Status. Controllers make a base salary plus location pay, night pay, Sunday pay, holiday and overtime pay. A Kansas City Pitch article, "Fear of Flying," states that the number of air traffic controllers in the United States is decreasing due to low pay and work conditions. The FAA's controllers union and FAA management have had considerable differences of opinion, including a breakdown and impasse in contract negotiations followed by an imposed set of working conditions, over the past few years. In 1981, President Ronald Reagan broke a strike of the then air traffic controllers union, PATCO by firing the strikers and permanently banning them from federal service. In the UK there are three main routes to becoming an Air Traffic Controller. One is to join NATS as a trainee controller: this is the only way for people wishing to become Area Controllers. Another is to join a non-NATS airport as an Air Traffic Services Assistant with a view to being sponsored by the employer to become an Air Traffic Controller. The third way is to pay for one's own training to licence level with a view to being hired afterwards (usually by a non-NATS airport). Controllers can earn up to £85,000 per year depending on employer, experience and the unit at which they are employed (the highest salary potential for NATS Controllers is at Swanwick and Heathrow). Controllers employed by NATS, on appointment as an Air Traffic Controller (3rd anniversary of joining NATS) earn between £40,000 – £45,000 plus shift pay of approximately £5,250 (Jan '08). Darcy Frey's 24 March 1996 New York Times article, "Something's Got to Give" (which was the inspiration for the movie Pushing Tin, below) presents an image of a busier air traffic control centre being only a few moments of inattention away from a mid-air collision. The movie Pushing Tin starring John Cusack and Billy Bob Thornton centers around the life and times of a group of air traffic controllers. Another movie, Ground Control (1999), features Kiefer Sutherland as a guilt-ridden air traffic controller who formerly caused the crash of an airliner due to an operational mistake and abandons the career, but later is called back in an emergency and has a chance to redeem himself. The 2006 movie United 93 include some scenes of the control tower that monitored the flight on September 11, 2001.